It's become a modern tradition at Eid for me to snap my outfits, but last year I got so caught up in the day, it just did not happen. I know that there was an outpouring of emotion (mostly tears) on my Twitter feed when I revealed that I'd simply forgotten, so I made certain to remember this year! My brother visited India at the back end of last year and, as per another family tradition, asked me if I wanted anything. I asked for a copy of Vogue India, yet another tradition of mine actually, all of the bindis he could get his hands on but top of my wish list was a white sari with silver embellishments. So when brother arrived back home from India, I was excited to see what magical white sari he'd been able to find me - oh, and to see him too, yeah. As it happened, he handed over the most gorgeous, blindingly white sari with the most beautiful silver embellishments. 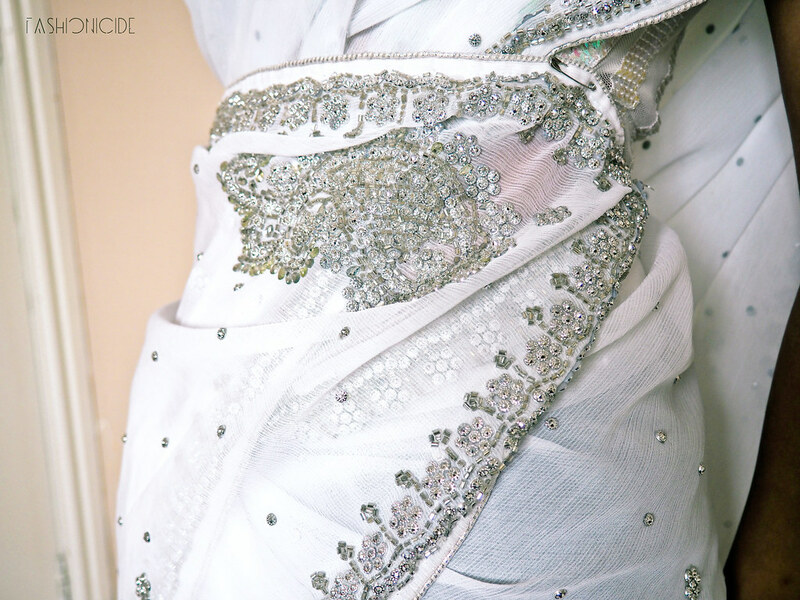 Apparently, tracking down an embellished white sari was quite the challenge, as most sari shops only sell plain white ones, worn by Hindus to funerals. It took an army (my brother, a few cousins, a couple of uncles, a dog, a chicken and a cow) to hunt around the bazaars of Bangalore and find the truly, genuinely elusive embellished white sari. Fortunately it only took them a couple of hours before finally finding one, and thus the true inspiration for Pokemon Go was born. Ok, not really, but still. So of course, I apologised (#SorryNotSorry) for all the effort they went to. THANKS BRO! So, when Eid arrived, I naturally opted to wear something completely different. HA. No, I think my bro might have actually killed me, or at least thrown some biryani at me. Of course, I chose the white sari and paired it with an iridescent striped white crop top. 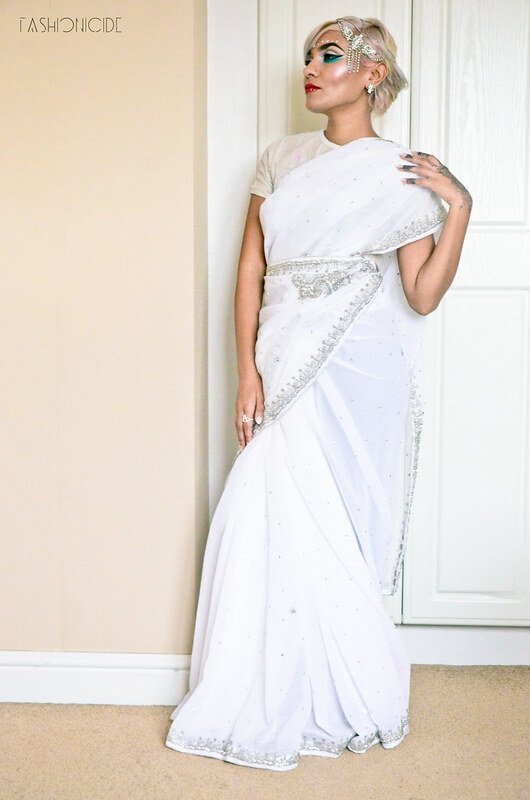 I had to enlist the assistance of my sister in law, who's a sari-wrapping genius to help me do it all for me, and I was hoping to learn from her, but it was all over in a blur and I felt a bit dizzy! Those skillz though. 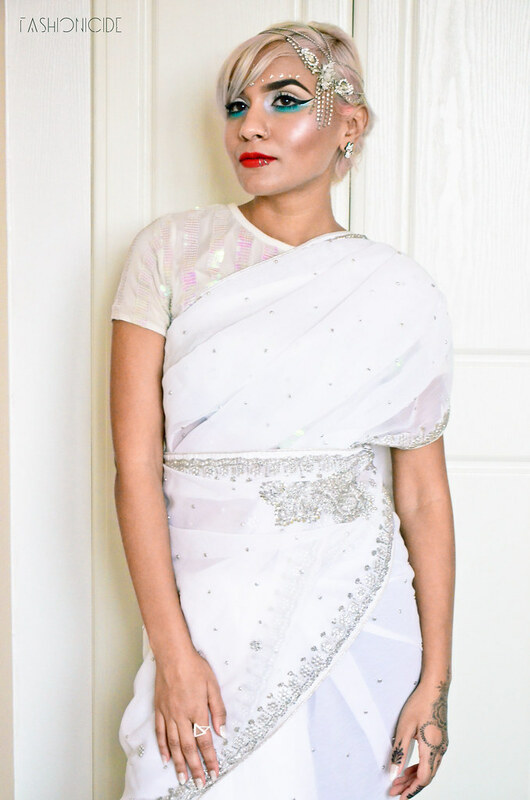 I'd also bleached my hair and coloured it white with rainbow hues a few nights before, so when the sari was all wrapped, I honestly felt like a billion dollars. The whole outfit felt so decadent and luxurious - as if dressed and ready for my close-up in a Bollywood movie. It was a fantastic day, as usual, with food, laughs and fun in plentiful supply, and the sari certainly fared well against all of the other outfits on show! The great thing about Eid, is the next one is only seven weeks away from now - bring it on! You look so beautiful in that sari, love the embellishment on it. Your makeup is dramatic too and sets the outfit off. Oh Wow. Just Wow. I was taken back by this on Snapchat but now seeing the full glory in photographs! Stunning. You know when you see something and think, I really wanna touch that (in a non pervy way of course... ;)? That's exactly how I feel about your Sari, I just wanna touch it!! It looks so delicate and soft. You look so beautiful. I adore your outfit and hair. It's just so, so beautiful!! I know everyone else has already used this word but you really do look stunning. Everything about this look is absolutely beautiful, your brother did well!